Where commonality of interest exists, nations will enter political, economic, and military partnerships. These partnerships can occur in both regional and worldwide patterns as nations seek opportunities to promote their mutual national interests or seek mutual security against real or perceived threats. Cultural, psychological, economic, technological, and political factors all influence the formation and conduct of coalitions. Another reason nations conduct coalition operations is that rarely can one nation go it alone either politically or militarily. Coalition operations will involve a comprehensive approach that includes other government agencies, nongovernmental organizations, and international and regional organizations. This blending of capabilities and political legitimacy makes possible certain operations that a single nation could not or would not conduct unilaterally. Almost all coalition operations, regardless of how they are formed, build from common fundamentals. All coalitions form in one of three ways. Coalition headquarters have similar components. In addition, all coalitions assess the area for operations. Many of the points will be further developed in the individual chapters. A coalition is an ad hoc arrangement between two or more nations for common action. A coalition action is a multinational action outside the bounds of established alliances, usually for a single occasion, or for longer cooperation in a narrow sector of common interest. 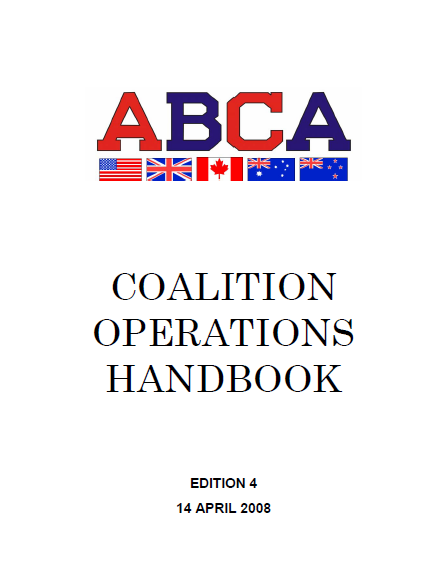 This handbook centers on those operations in which one or more of the ABCA armies participate with other non-ABCA nations in a coalition. Sovereignty issues will be the most difficult issues for the commander of the coalition force to deal with, both in regard to forces contributed by nations and by host nations. Often, the coalition force commander is a “commander” in title only; the coalition force commander will accomplish the mission through coordination, communication, and consensus or leadership rather than by traditional command concepts. Such is the nature of coalition operations. Coalition operations are conducted by forces of two or more nations, which may not be allies, acting together for the accomplishment of a single mission. Coalition operations cross the spectrum of conflict from major combat operations to peacetime military engagement. Coalition operations are a subset of multinational operations. These operations can also include various nonmilitary organizations and other services. Conducting military operations with foreign military partners, like operations with civilian partners, is uncommon to many soldiers, so a clear understanding of this different environment is necessary. Coalition operations may be driven by common agreement among the participating coalition partners or through a mandate provided by the United Nations (UN). Either way, their multinational character merits particular attention because national interests and organizational influence may compete with doctrine and efficiency. Consensus is painstakingly difficult, and solutions are often national in character. Commanders can expect contributing nations to adhere to national policies and priorities, which at times complicates the coalition effort. In UN-sponsored coalition operations, a force is employed under a single commander. The secretary general appoints the force commander with the consent of the UN Security Council. The force commander reports either to a special representative of the secretary general or directly to the secretary general. While the force commander conducts day-today operations with wide discretionary powers, referring all policy matters to the special representative or secretary general for resolution. In coalition operations, consensus building to ensure compatibility at the political, military, and cultural levels between partners is key. A successful coalition must establish at least unity of effort, if not unity of command. The success of a coalition operation begins with the authority to direct operations of all assigned or attached military forces. The coalition force commander has much to consider, in addition to military considerations. Considerations such as the strategic context within which the operation will be carried out; civil administration; the reestablishment of justice; civil policing; humanitarian assistance; post-conflict development and reconstruction; the possibility of election organization; financial management; and multicultural issues. Commanders must harmonize these considerations to ensure that the operation has the best possible chance of success. Doing this well, early, and professionally with the optimum level of input and upfront accountability from all likely participants will provide a firm base for a successful operation.